A famous economist in the 1800’s came up with the concept of the Pareto principle. In basic terms, the Pareto principle says that in any system, the small minority is responsible for the majority of the results. For example, in any company, 80% of the results, profits, and things that move the company forward in general is the product of only 20% of the employees. Another example is 80% of the money that you are making is the product of only 20% of the things that you actually do throughout the day. In the case of many people, 80% of the actual results that they accomplish with their jobs results from only 20% of their actual work time. The rest of the time that they spend at work are non-productive activities like wasting time on Facebook, calling friends, playing crossword puzzles, or any other online distraction. So how does the Pareto principle help your online business? It helps it in a very powerful way because it allows you to analyse all your activities for the day and then zero in on the items that actually move your business forward. The rest you can either outsource, delegate, or just get rid off because these do not move your business forward. Remember, we do not have much time left in this world. Each and every second that we are alive is a second that we are close to dying. That is a fact of life. Time is a finite resource. Once gone, it can never come back. Treat it like diamonds –precious and rare. If you find yourself spending 80% of your time to produce only 20% of the results that you need to move your business forward, then you are doing something wrong. 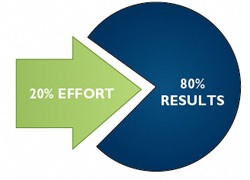 The Pareto principle is a very important help to any business because it forces business owners to sit down and think of the 20% that they are doing that pushes their company forward. This way, they can devote as close to 100% of their time to these activities so they can take their business to the next level. That is the true way to success, not fiddling around with the 80% that is fun to do and keeps your mind off work, but really just leads you to the poor house.